324 pages | 326 Color Illus. Forensic chemistryis a subdiscipline of forensic science, its principles guide the analyses performed in modern forensic laboratories. Forensic chemistry’s roots lie in medico-legal investigation, toxicology and microscopy and have since led the development of modern forensic analytic techniques and practices for use in a variety of applications. Introduction to Forensic Chemistry is the perfect balance of testing methods and application. Unlike other competing books on the market, coverage is neither too simplistic, nor overly advanced making the book ideal for use in both undergraduate and graduate courses. The book introduces chemical tests, spectroscopy, advanced spectroscopy, and chromatography to students. The second half of the book addresses applications and methods to analyze and interpret controlled substances, trace evidence, questioned documents, firearms, explosives, environmental contaminants, toxins, and other topics. The book looks at innovations in the field over time including the latest development of new discernible chemical reactions, instrumental tools, methods, and more. 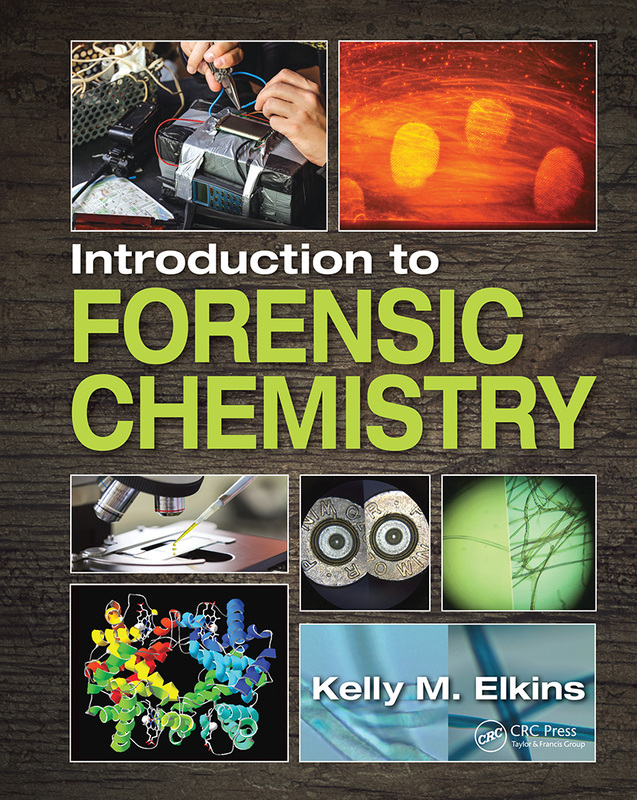 Comprehensive and accessible, without being overly technical, Introduction to Forensic Chemistry will be a welcome addition to the field and an ideal text designed for both the student user and professor in mind. Course ancillaries including an Instructor’s Manual with Test Bank and chapter PowerPoint® lecture slides are available with qualified course adoption. Kelly Elkins earned a BS in Biology and BA in Chemistry from Keene State College in Keene, New Hampshire. She went on to earn MA and PhD degrees in Chemistry from Clark University in Worcester, Massachusetts. She was a Fulbright Scholar in Heidelberg, Germany from 2001-2002 and a Cancer Research Institute Postdoctoral Fellow in the Biology Department at MIT in Cambridge, Massachusetts from 2003-2004. She was a Temporary Assistant Professor of Chemistry at Armstrong Atlantic State University in Savannah, Georgia, for two years and an Assistant Professor of Chemistry at Metropolitan State College of Denver in Denver, Colorado, for five years, where she served as Director of the Criminalistics Program (2010-2012), a Forensic Science Education Programs Accreditation Commission (FEPAC)-accredited program, supervised undergraduate research and internships, and developed the curriculum for their Criminalistics II (Forensic Biology) course. She joined the Towson University Chemistry Department and FEPAC-accredited Forensic Sciences program in 2012 where she is currently Assistant Professor of Chemistry and Graduate Faculty in the Masters of Science in Forensic Science Program. She teaches undergraduate and graduate forensic chemistry courses including Forensic Chemistry, Forensic Serology, and Weapons of Mass Destruction. Her research interests include the development of new methodologies and course materials to support forensic science. Her research focuses on the development of new real-time high resolution melt PCR assays for species identification of "legal high" plants, controlled species, and food-borne pathogens.